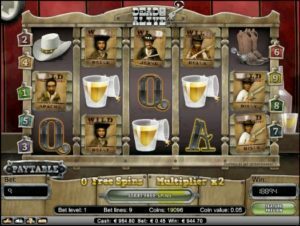 Dead or Alive is the perfect game for the western fans out there and because it’s a NetEnt slot, we at Boku Slots have high expectations. So, lets delve into the gun slinging antics and see what bonuses and features they have in store. 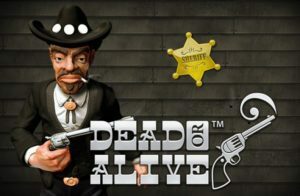 Dead or Alive is a 5-reel, 9 pay line slot game that has a rootin tootin RTP of 96.8%. The background theme is a wooden noticeboard, so it doesn’t really evoke much enthusiasm for the game as it begins. Bet Amounts – Betting begins at just 1p per pay line making it 9p per spin, but it can be increased to 50p per pay line making it £4.50 per spin. However as with most NetEnt slots there is the variable coin level to consider. This means you can change your bet level from 1 to 4 and this will alter the amount per spin as well. Always ensure you have checked that your bet amount is within your range, by adjusting the coin amount and coin level accordingly before hitting spin. Wild Symbol – The wild symbol is the well-known wanted poster, featured in so many westerns gone by. It will substitute for all symbols except the scatter. The wild is also the second highest paying symbol in the game offering an award of 1500 coins, if you land 5 wilds across an active pay line. Scatter Symbols – Your scatter symbol is a set of crossed pistols. Land 3 or more pistols on the reels and you will trigger the bonus spins feature. The scatter is the highest paying symbol within Dead or Alive and offers 2500 coins, if you land 5 across an active pay line. Other Symbols – After your two highest paying symbols, the scatter and the wild you have a range of other symbols to play for. These include, in descending order the sheriffs badge, gun belt, Stetson hat, boots and spurs, shot of whiskey and the letters A, K, Q, J and 10. Bonus Spin Feature – Having landed three or more scatters on the reels you will trigger the bonus spins feature. You will be awarded with 12 spins and each win will be multiplied x2 during the spins. During the bonus spins the wanted posters will become sticky wilds and will remain in place for the duration of the spins left. If you manage to land a wanted poster on each of the five reels you will be awarded an extra 5 spins, but this will only happen once. Overall Dead or Alive is a very promising game, although not our favourite from NetEnt. The graphics are a little 2d for our liking, but that certainly doesn’t affect the general enjoyment of the game. The bonus game triggers easily and can become quite lucrative, with wins as well as extra spins allocated. The piano that tinkles away in the background alongside the random gunshots heard, all lend an authentic saloon feel to the game.